From the makers that brought you Outnumbered. Now if you’re wincing at that title, then this may not be for you. 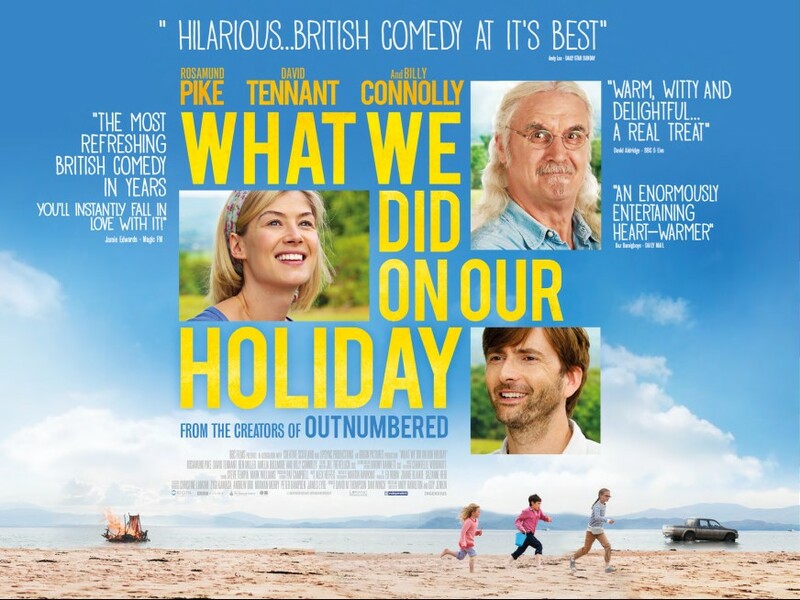 Doug (David Tennant), Abi (Rosamund Pike) and their three children travel to the Scottish Highlands for Doug’s father Gordie’s (Billy Connolly) birthday party. It’s soon clear that when it comes to keeping a secret under wraps from the rest of the family, their children are their biggest liability . . .
What We Did On Our Holiday very much follows that style and structure. Well, it is Outnumbered just with a completely different family. The children inevitably allowed the freedom to share their incredibly random but hilarious outlook on life. A nicey-nicey dramedy that leaves you smiling. All in all, not bad. Not without its imperfections but a stellar British cast, along with some little newbies, help smooth out the creases. David Tennant and Rosamund Pike (she’s been popping up everywhere at the moment and deservedly so) work well together as the sparring couple who must pretend to be happily married for the sake of keeping up appearances. However, the kids have other plans. Mainly because they are kids and have no idea why they have to lie when Mum and Dad are always fighting and live in separate houses. Harriett Turnbull and Bobby Smalldridge are fantastic as the curious little tykes. They come out with some belters that were most definitely not scripted. A highlight for me was when the little ‘uns met Annette Crosbie’s (One Foot in the Grave) lesbian ostrich farmer (You read that right). She attempts to explain her sexuality, leading to the kids believing she is from a place called Lesbia. Smalldridge completely catches Crosbie off guard with a question about putting an ostrich’s egg back up her bottom. Even the comedy veteran cracked a grin. Billy Connolly was, to be expected, brilliant. His story line with his ailing health hits a little more close to home. Especially with what the comedian is going through. The discussions of death with the children are done very well and his character is instantly loveable as the giggling granddad. The family arguments are dealt with brilliantly and tackle the issues of divorce and spite, with the children inevitably suffering. Ben Miller (Death in Paradise) doesn’t do a bad Scottish accent and plays the pompous uptight brother very well. Amelia Bullmore (Scott and Bailey) played quite a subdued role. That was until we dig into the reason (Luckily there was one) behind her silence. The answer lying in a YouTube video viewed by millions. Brilliant. However, these stellar comedy actors were always going to play second fiddle to the kids. Andy Hamilton and Guy Jenkin have introduced another set of future prospects. Turnbull was definitely the adorable scene stealer. Her gruelling interrogative manner with Ben Miller was worth the ticket price alone. Halfway through this easy going fam-dram, there is an unexpected twist. Well the outcome of the twist was predictable but how the characters deal with it surprised me. It certainly played with the macabre. I won’t say much more because this a film I want people to see. It’s not all perfect. I wish more was made with the family drama. It all gets heated, brilliantly acted but then evaporates into a corny finale with cheesy grandiose speeches and everybody singing and dancing. Bullmore’s character was clearly going through some sort of breakdown and how Gavin (Ben Miller) treats her and their son Gordy (Ryan Hunter) was quite poor. To be honest, Gordy was a bit of a drip. It could have been down to Gavin’s treatment but nothing was made of it. A wasted opportunity. Celia Imrie (The Love Punch) played such a small limited role. A shame for a talented actress. She did well but anyone could have played her. Another minor quibble was the relevance of the escaped ostrich? It kept popping up and running across the screen. By the end of the film, apparently none and it wasn’t even funny. Despite a darker twist, the film was always going to be a fluffy family drama and it all ends a little too cheesy and happily for my liking (Maybe it’s the cynic in me) but certainly one of the better ones. Worth an investment.